Tom Mitchell is the chairman of the Moore & Van Allen Management Committee and a nationally recognized finance lawyer concentrating in the area of loan syndications. Tom has extensive experience representing banks and other financial institutions in a variety of debt transactions, including acquisition and highly-leveraged financings. 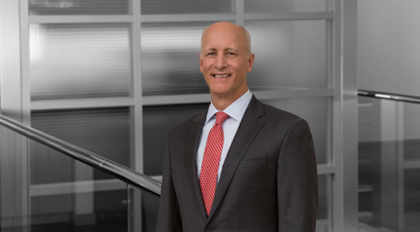 Tom also serves as co-chair of the firm’s Financial Services Practice Group and Business Development Committee. Tom has been consistently recognized as a leading banking and finance lawyer in Chambers USA and Best Lawyers in America. Chambers USA describes Tom as “extremely seasoned and a go-to attorney who provides sound legal advice” and as a lawyer “who is great to work with and always responsive”. Tom is active in the community, including his present service on the board of the American Heart Association Greater Charlotte Division. He also serves on the Law Council at Washington and Lee University School of Law.